All year I have been trying to find a date in the diary to co-ordinate a trip to a chalk stream with Alan Ward. We go back a long way through the Army, Alan now works as a semi professional photographer and pens the odd article for publication. Boasting over 25 front covers you could say he is an accomplished photographer, you can check out his work here. I really enjoy photography but I enjoy fishing more, often when I try to combine the two I end up doing neither very well. So it was a great boon to have Al along to do the snapping. I had never been to the Stonehenge Beat of the Avon but it had come highly recommended by Malcolm Hunt from Manningford. I have to say when I arrived at the bankside I was not disappointed. The banks were meticulously kept and the river was in perfect nick, it seemed to be the perfect depth for wading and there were several fish rising along its length. Al and I decided to walk the beat first to get a feel for the river and the best areas to fish. 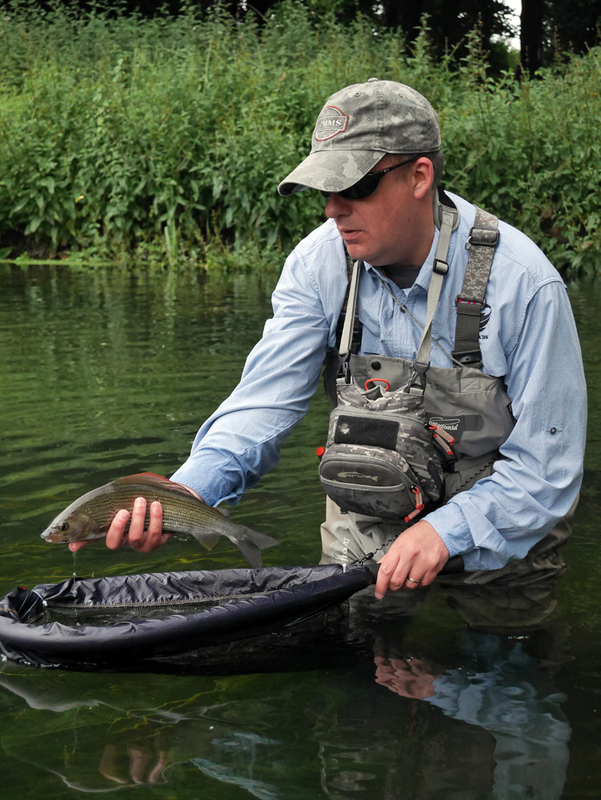 It was a wide meandering beat with long slow glides, perfect dry fly water. There were lots of Grayling present in the river and we did spot the odd Brown trout. This was chalk stream fishing as you would imagine it. There were no other anglers present by the time we got back to the car so it looked like we would have the beat to ourselves. stick with a Go-Pro attached! I also gave him two of my cameras as well just for good measure. I had tackled up faster than Alan had sorted out his camera kit and told him I would be in the river. I only had a couple of casts before catching the first of many 25-30cm Grayling. 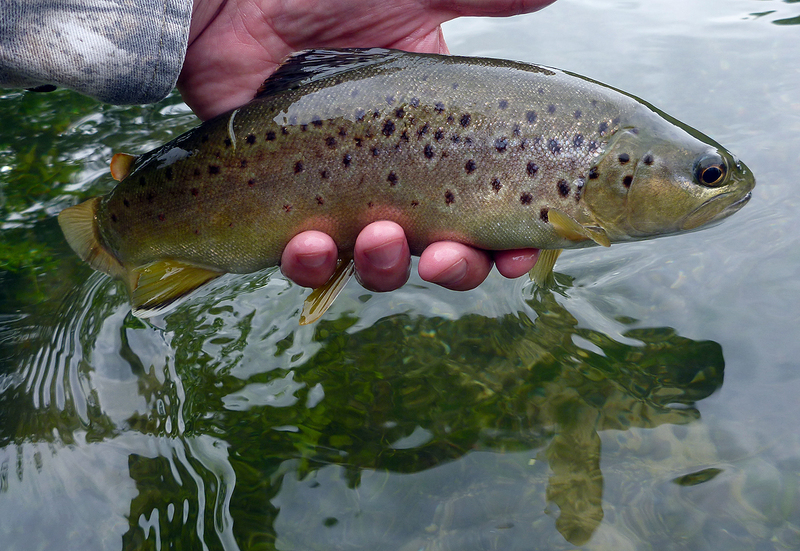 Stunning little fish that are perfectly formed, I was hoping for something a little bigger as the day went on. 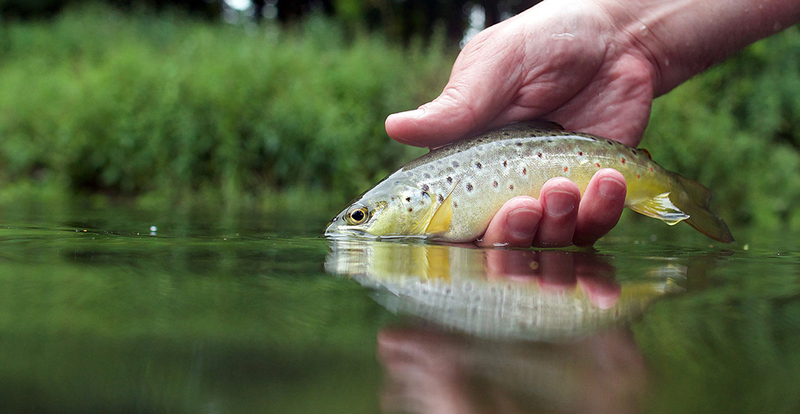 Alan had not long arrived when I hooked the first Brown trout of the day. Not big but just lovely to behold, Stonehenge is a wild fish only beat so I was not expecting any really big fish. We moved upstream slowly as the water was so still that even moving carefully would cause a bow wave to ripple upstream immediately calming the water of any rising fish. 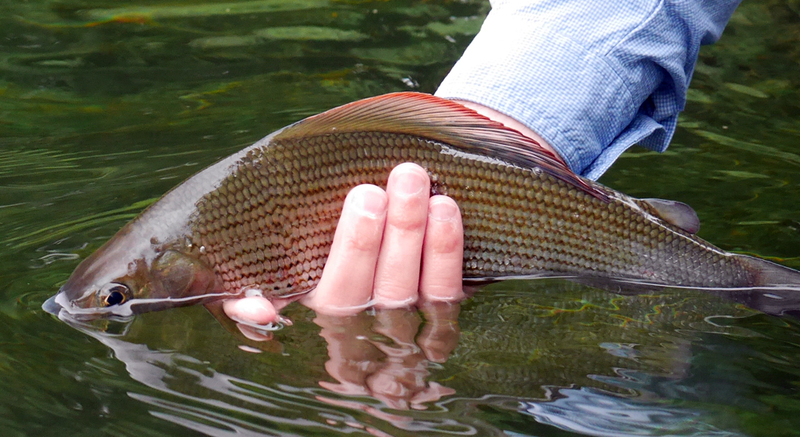 The Grayling were easy enough if you covered them more often or not you would be rewarded with a chance. Alan spent some time photographing the fish and I was glad of the Glen Pointon floating net. The fish could be kept in this once unhooked. This allowed Alan the time to sort out his shot and get what he was after without causing undue stress to the fish. We had moved up maybe 50 meters and after catching predominantly Grayling with the odd small Brown trout the pressure was on to get Alan something a little bigger to photograph. I was more than a little relieved when my two weight buckled over and a better fish went ballistic carting this way and that. I knew from the way it was fighting that it was a reasonable sized Brown. I was very pleased to see it slip into the net and Alan did the honours with the camera. Though not a huge fish on the very light tackle I was fishing it had given a great account of itself. After the fish was safely returned the call of nature beckoned. Not one to see a fly rod sitting idle Alan had a go himself quickly bringing a small Grayling to hand. Not a minute later Alan had hooked a pretty nice Brown trout, life in the old dog yet! I think he would have like to fish on but I was keen to get back to work. 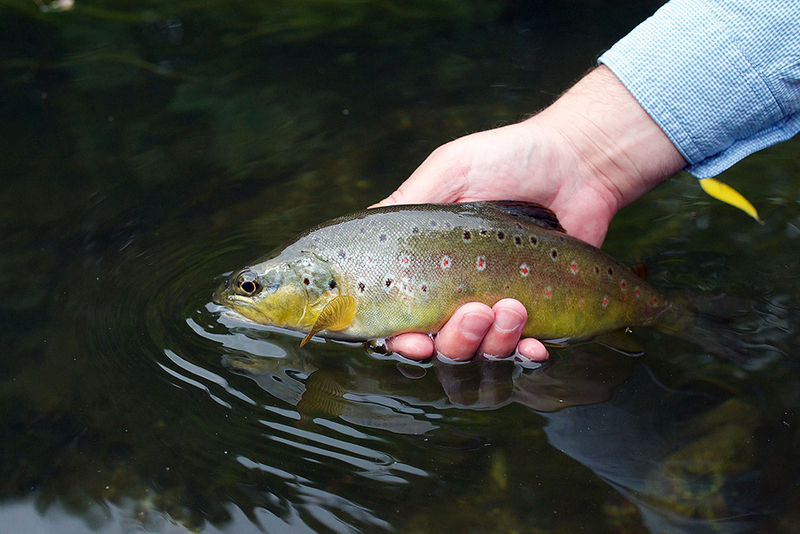 I took charge of the rod once more and tried in vain to recover the dry fly it had been mullered. I changed it over and gave it a little treatment, I have been using some of the Glide Floatant. It’s a lot like Gink but not as expensive and does exactly the same job. We had pushed maybe halfway up the beat when a chap turned up to trim a bit of branch from the path by the river. I had not even noticed it the chap was Chris Thomas and he was a bailiff for the S&D club. I introduced myself and he was a variable font of knowledge on the S&D waters and was more than happy to give advice on where else to try. After Chris had moved on we moved to an area that we had marked where a good fish had been lying. Alan had moved up the bank and confirmed it was still there. Double teaming it with me casting to Alan’s direction I failed to tempt the quarry. After making several fly changes to no avail and then eventually spooking the fish it was time to move on. I missed out a large chunk of water as there was another angler on the opposite bank. I ended up popping out near to the end of the beat. This was a great looking part of the river with long beds of ranunculus flowing in the crystal clear water. 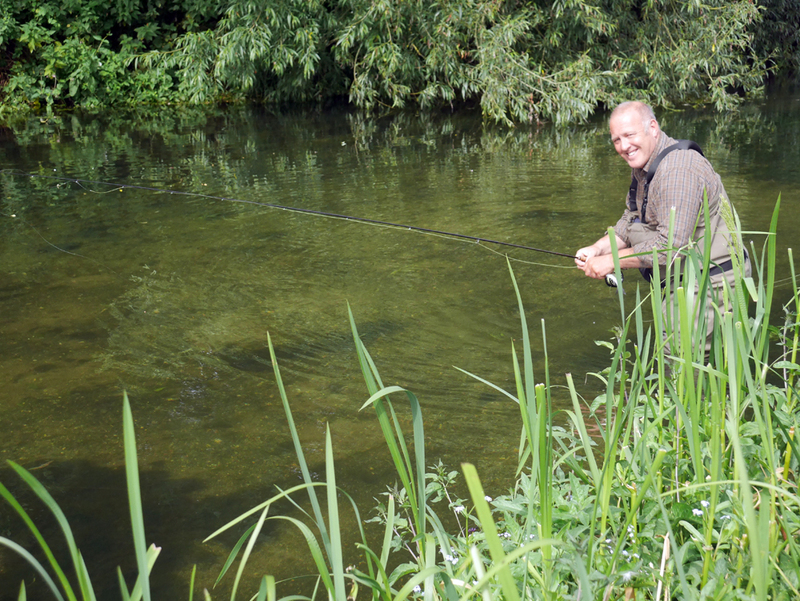 There were long runs with a quicker flow and clear channels where you would imagine fish to lie. After taking a few fish though my tummy clock was telling me it was lunch time. So back to the car for a bite to eat and a catch up with Alan. saddled up and headed to the gate, where I met Chris again. He had asked if I had seen the vandalism to the returns book, but I had not as I had forgotten to complete it. He told me that a gang of small kids had ripped and defaced the book, little falkers! Would you not just pay good money to catch them doing it? It’s about 11 miles to Manningford from the Stonehenge beat and I had warned Malcolm off that I would be around with a photographer in tow. The bit I wanted to fish is not the easiest in the world and having been spoiled in the morning it took me some while to adjust to the much narrower and tree canopy enclosed stretch. I knew it would be worthwhile though as there were some pretty big fish in this stretch. So after much cursing and loss of flies and of course real flies buzzing round and making a nuisance of themselves I eventually started to get into it. The first few fish were small Grayling but eventually I started getting the odd Rainbow but they were still on the small side. Opportune feeders anything that fell onto the river from the trees was met by a rising fish. As I was drawing to the end of the run I was fishing thoughts of a better fish were drifting away. Suddenly in the shallowest of water there was an eruption as a big Rainbow engulfed my fly. Just what I was after as I tightened up on the behemoth it leapt into the air almost beaching itself on the bank. Unfortunately for me it did not make the bank nor the net, it’s one huge leap had dislodged the hook and it was gone. It left a visible V shape in the shallow water as it headed for the hills. I have to say I was a little disappointed and I said to Alan what a great shame, well actually it was more along the lines of “you **** piece of *** **** ***ing *****” we’ve all been there so I am sure you get the picture. Time was wearing on and I was getting pretty tired, one last bit to try before calling it a day. We had passed an area on the way up that held a couple of nice Rainbows, it was worth a chuck. I started by edging up the edge and managed to fool a couple of small Grayling. But I was hoping for something a tad bigger. After making a couple of really awkward casts round a corner which I could not really see land, I heard a splash and speculatively lifted my rod. I was in, as I broke from cover I could see it was a decent fish. I was fishing light and tested the tackle to its limit the fish was in a charitable mood and splashed and thrashed straight into the waiting net. The photography part was very difficult under a dark canopy of trees; the light was awful. Alan was having some technical issues with his kit and we only managed a couple of half decent images. Still a nice way to finish up the day and we headed back to the lodge where we had parked up. We sat discussing the day and the prospect of a future project when the Trout season was finished. A great day out plenty of fish in the most idyllic of locations. Not only that I got to catch up with an old friend and ended up with some great images from the day. I really cannot wait to explore more of the S&D water. The problem is its like being a kid in a sweet shop always wondering which to grap next. Really looking forward to my next outing maybe I can tempt my pal Graham Lumsdon to come along for a day out? I have recently added a fly fishing forum to the website please feel free to join and add value to the threads it can be accesssed from the link above in the navigation bar.